UF researchers investigate two different strategies to alleviate behavioral deficits in rat models of Parkinson’s disease. They are pursuing both direct intrastriatal transmitter replacement (L-dopa delivery) and neurotrophic support strategies (GDNF delivery) in the unilateral 6-OHDA lesion model of PD using recombinant adeno-associated viral vectors (rAAV). The McKnight Brain Institute-based team has started analogous studies in primates to obtain the data necessary to support a Phase I clinical trial using rAAV in PD. This field has been greatly engergized lately by very positive findings reported from Jeffrey Kordower’s laboratory at Rush Presbyterian–St. Luke’s Medical Center using a recombinant lentivirus to deliver GDNF to the rhesus monkey striatum (paper below). We also have very important studies underway to develop regulated vectors to express GDNF. Another major interest in the UF Gene Therapy laboratory is using rAAV vectors to study the etiology of Parkinson’s disease. 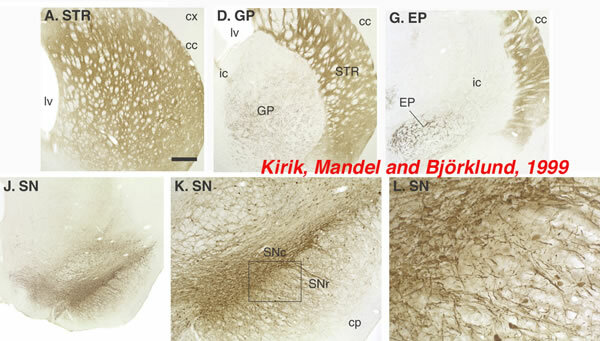 This interest was fueled by the important observation that rAAV vectors have a proclivity to transduce substantia nigra, thus allowing us to render the nigrostriatal tract transgenic (see first picture below). We are currently funded by the Michael J. Fox Foundation for such studies. The laboratory has also begun experiments using rAAV to transfer ribozymes and/or siRNA (paper below) to the striatum of transgenic mice expressing a mutant form of huntingtin to determine if knocking down gene expression will block Huntington’s disease-like pathology (see). Other projects involving gene transfer in Huntington’s disease models concern the trophic factors brain derived neurotrophic factor (BDNF) and ciliary neurotrophic factor (CNTF).